BRACKNELL, UK. 26th October 2016 – Severn Trent Water is equipping its infrastructure field workforce with 1000 fully rugged Panasonic detachable notebooks to help improve operational efficiency and customer service. 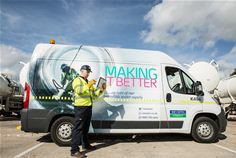 The water company has invested in the Panasonic Toughbook CF-20 detachable notebooks for the long-term and as the ideal device for use alongside its development programme for more intuitive mobile applications.